A Chess Board is NOT included in this sale. only the chess pieces with case are included. The pieces are all natural hard wood color, no paint or stain has been used. WOOD CHESS SET KINGS & QUEENS ARE 5 1/ 4 " TALL BOARD IS 17 1/2 "X 17 1/2 "
BOARD IS 17 1/2 " X 17 1/2 " KINGS AND QUEENS ARE 5 1/4 " TALL BASE ARE 1 1 / 8 " PAWNS ARE 3 1/4 " TALL ( LOOK AT PICTURES ). All other pieces range in between. No Board included. Made in Russia. Height of a piece - up to 1.6" // 4.1 cm. 7”x 4.75”x 1.5” miniature handmade with inlaid white maple or poplar stripes. Pictures are part of description ask questions as needed. Stop in and take a look at my other items and let’s make a deal. There looks to be a crack across the bottom but doesn’t affect the function. There’s also a small hole in the bottom not sure what that was for. It was drilled. Other than that great condition everything is there each piece it’s a little little hole. The pieces are handcrafted in Poland. Good, used condition. All the pieces are intact and in great condition. Two Face Wood Box Made in W Germany. CONDITION : NO CRACKS, BREAKS, OR REPAIRS. NO ISSUES. WORKS WELL. LIGHT WEAR NOT UNCOMMON FOR AGE. SEE PHOTOS. Folk art hillbilly chess pieces (no board included). Most of my carvings tend to be small so I can move from an idea to a finished piece relatively quickly. After creating a few typical hillbilly caricatures, they took on a life of their own. 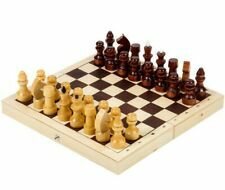 The Ambassador Chess set - The Premiere chess set in the Polish Wooden Chess Set Series. Pieces match board. Queen's crown wears opposition colors. King Height: 4 1/4". Board Size: 21". Set & Board made of Beechwood & Sycamore. Very nice Condor wooden chess board. This is a vintage piece, it has some nicks and scratches. See pictures for close up details of condition. 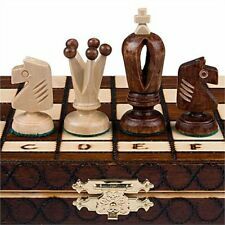 This is an exclusive Handmade Handicraft wooden chess set. The amount of handwork required to make this exclusive chess set is difficult to imagine. The speciality of Ebony wood is that it is natural black wood. Details of age and wear in the pics above. CHESS SET TABLE CONQUISTADOR vs AZTEC EMPIRE WOOD STONE CARVED 19” BOARD 6” KING. Please look closely at the photos as they are part of the description - thanks! Condition is Used. Shipped with Standard Shipping. Tournament No. 5 Staunton European Wooden Chess Set - 18.5"
In going through the Trojan Hoard I occasionally find odd things. The set is in very good condition, but one of the original pawns is replaced by a pawn that is a near-match. Original instructions included! Cards Are Still Factory Sealed. The 12 3/4” square Chess board with light and dark inlaid 1 1/2” squares has another board with unfinished edges on the bottom side underneath the 11” square raised and laminated wood base. The base lifts it off the table edge and has the initials JJT wood burnt into the bottom corner. Blue Consul Wooden Chess Set - 3 1/4" King. Pieces nest inside folding Chess Board for ease of storage. Chess Board is 19" x 19". Wooden Chess Pieces made from sycamore. Chess Board Made from Beechwood. There are plenty of chess boards out there that are good, but why get good when you can get breathtaking. That's right, take one look at this extra large sized chess board and you'll be at a loss for words. These beautiful handcrafted works of art represent a platoon. They areunweighted and in very good condition with paint loss as shown in the photos. If you want an extra large and high quality chess set, this is the one to get. 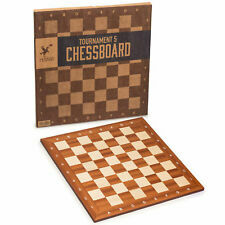 This folding wood set has a chess board that has inlaid squares. Included in this chess set areextra heavy weighted light and dark chess pieces. Hand-Crafted in Poland for Wegiel. If you want an extra large and high quality chess set, this is the one to get. This folding wood set has a chess board that has inlaid squares. Included in this chess set are extra heavy weighted light and dark chess pieces. 3 pieces missing: 2 black pawns, 1 white queen. Condition is Used. Not orginal owner, but it does appear to be handmade with inlaid mother of pearl. Could use a good cleaning - I did not attempt because I am not familiar with these types of materials. Chess Piece Set. Two Tone Walnut & Brass. Without you, There would be NO TONI-TIQUES ! Pawns are approx. 2" tall, rooks 2 1/4" tall, knights approx. 2 1/2" tall, queens 3 1/8" tall, king are approx 3 1/2" tall. IT IS IN EXCELLENT CONDITION. WITH THE BEST PICTURES POSSIBLE I WILL LET YOU MAKE UP YOUR OWN MIND OF ITS CONDITION. Large Scan transfer of wood grain minimizes wood pattern repeat. Set Weight: 2 lbs 15 oz. Part Number: 617037977405. Squares are outlined. These well designed pieces are weighted and are finished with red fabric bottoms. The set is housed in a wood box and is in very good overall condition, save blemishes as shown in the last photo. It is of an excellent quality and is made in China. Board folds in half that holds the pieces and serves as a carrying / storage case. This is the largest chess in our Sunrise Magnetic set series. 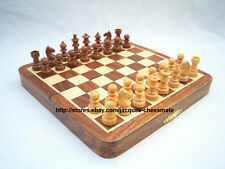 Its large chess board design is 15" x 15" (38cm x 38cm). The folding chess board has insert trays for storing the chess pieces inside. Board is made from beech and birch. Top has very thin black and white tiles with a black rim, that has one area that has a chip. 8.5" X 4 1/4" X 2" folded. Playing area is 6" X 6" with 3/4" playing squares. 1.5" tall with 1/2" base. 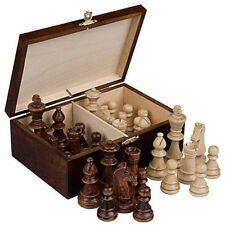 BEAUTIFUL TURNED WOOD CHESS SET | EXTRA LARGE PIECES | 6" KINGS! Color: Multi-Color. Chessboard Size: About 20 x 20 cm(L x W).